(Above) Chargers, cutlery, linens, glassware, and chairs from CORT Party Rental. Dinner and salad plates, cut-glass barware, candlesticks, and votive holders from Fanciful Rentals. Menus and place cards by Grey & Cake. Floral design by Valley & Company Events. 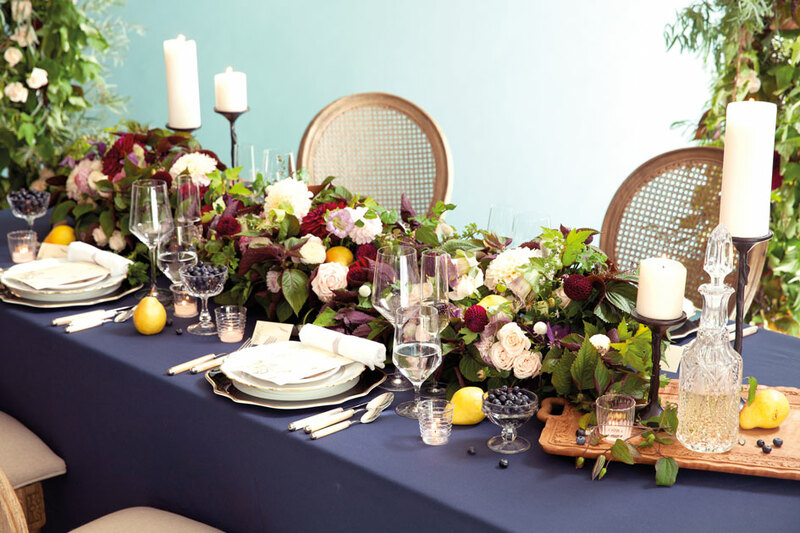 Table settings in a moody palette contrast beautifully with bright blooms and ripe fruit. 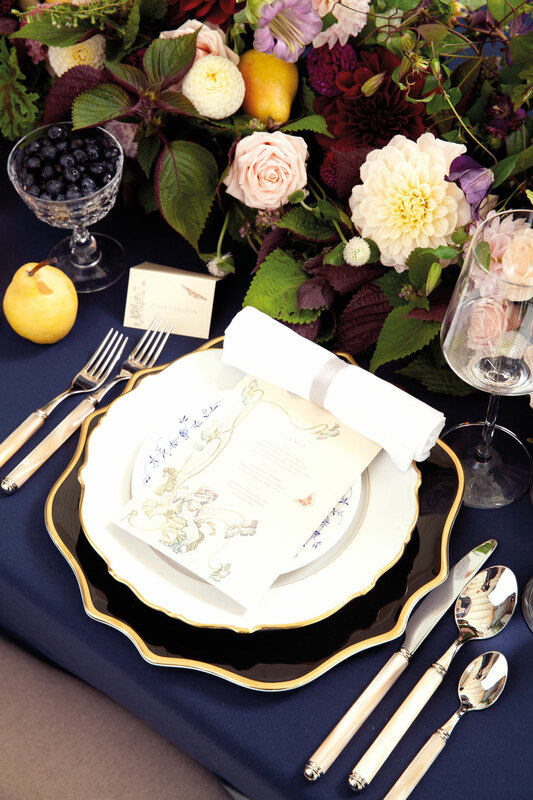 Table linens, cutlery, chargers, and glassware from CORT Party Rental. Goblet and plates from Fanciful Rentals in Ballard. Place card and menu by Grey & Cake. Cut-glass decanters elevate your cocktail hour and lend a sweetly Old World feel to the Midsummer Night Sipper, made with 2 ounces of St-Germain elderflower liqueur, 3 ounces of bubbly and 1 ounce of club soda. Garnish with berries or edible flowers. 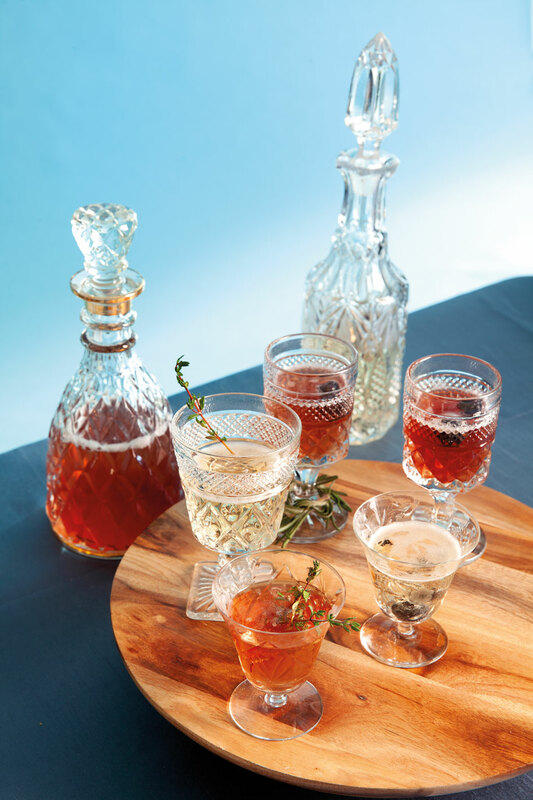 Cut-glass barware from Fanciful Rentals. 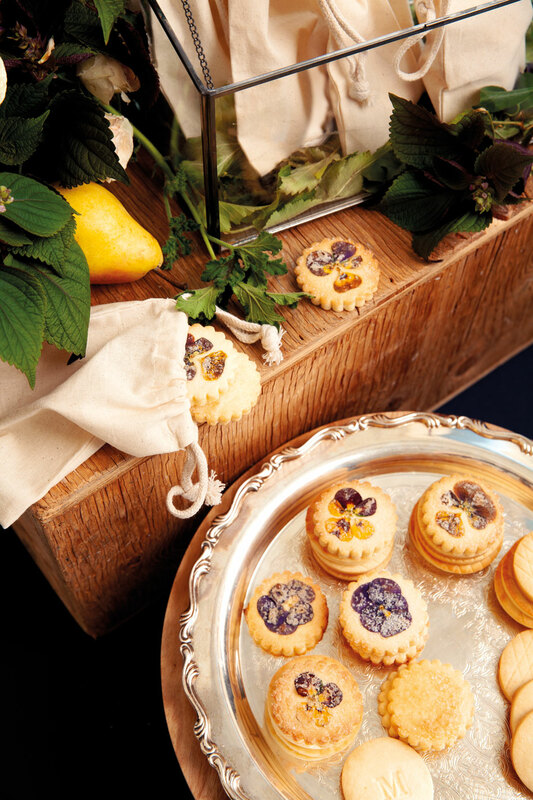 Pressed-flower shortbread cookie favors featuring edible pansies are a simply stunning way to impress your guests at the end of the party. Cookies by Ruth-Anne Ford in Seattle. 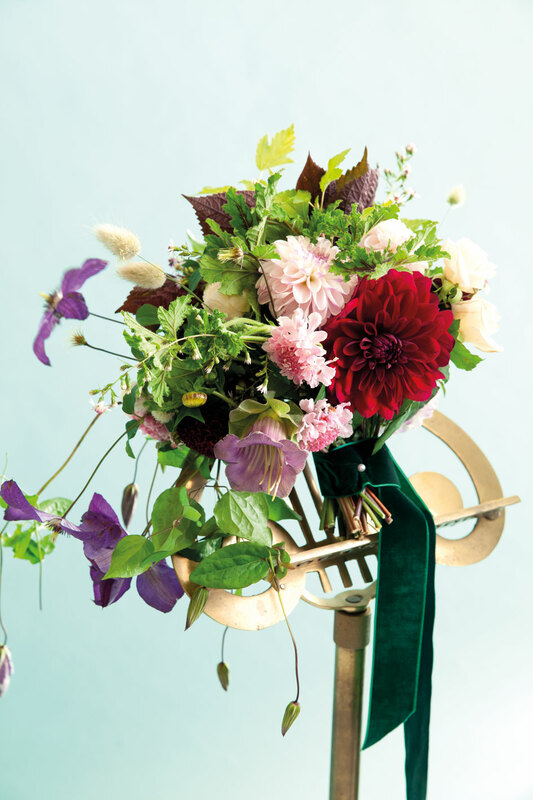 An unstructured bouquet by Valley & Company Events, filled with dahlias, clematis and greenery and displayed on a music stand, adds a wild and rustic touch to a timeless celebration. Brass music stand from Fanciful Rentals. 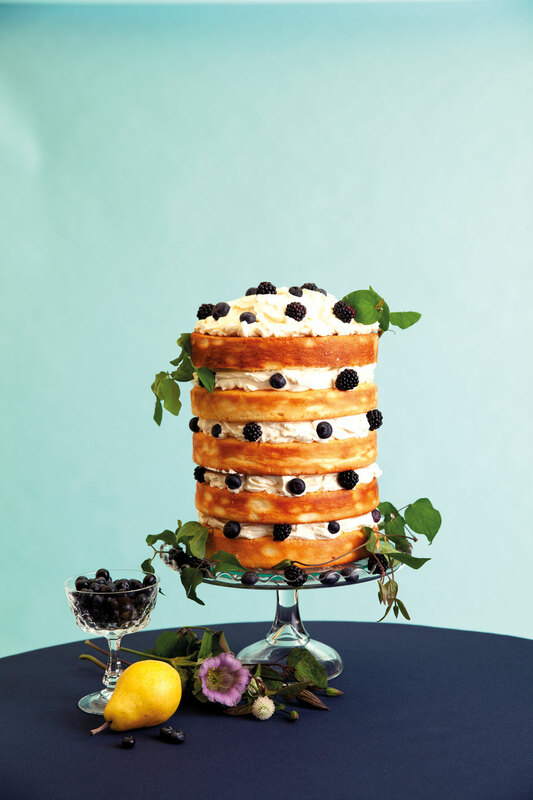 With citrus Swiss meringue buttercream filling rather than frosting, a five-tiered honey-orange buttermilk cake by Ruth-Anne Ford, studded with ripe blackberries and embellished with raspberry foliage, feels at once contemporary and nostalgic. “The cake’s sweetness is balanced by the tang of the berries and the warmth of the honey,” says Ford. Goblet from Fanciful Rentals. 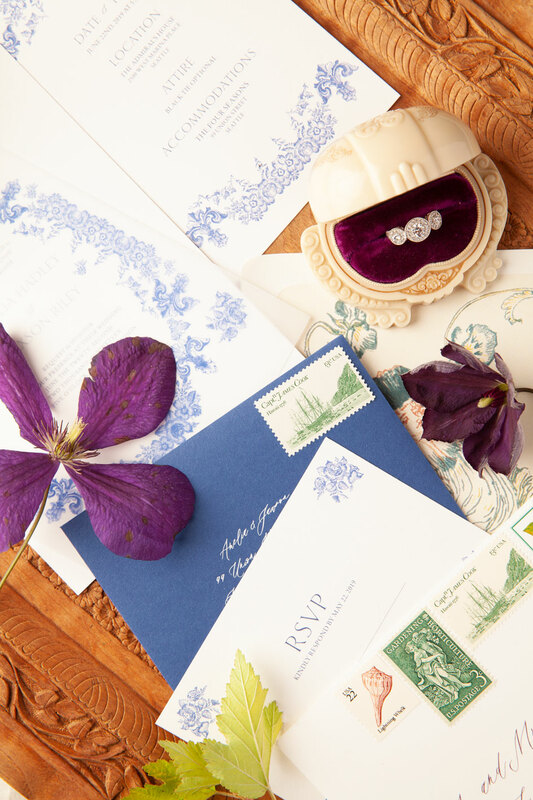 Seattle-based Grey & Cake created a romantic invitation suite around a classic botanical motif in a cool shade of blue. 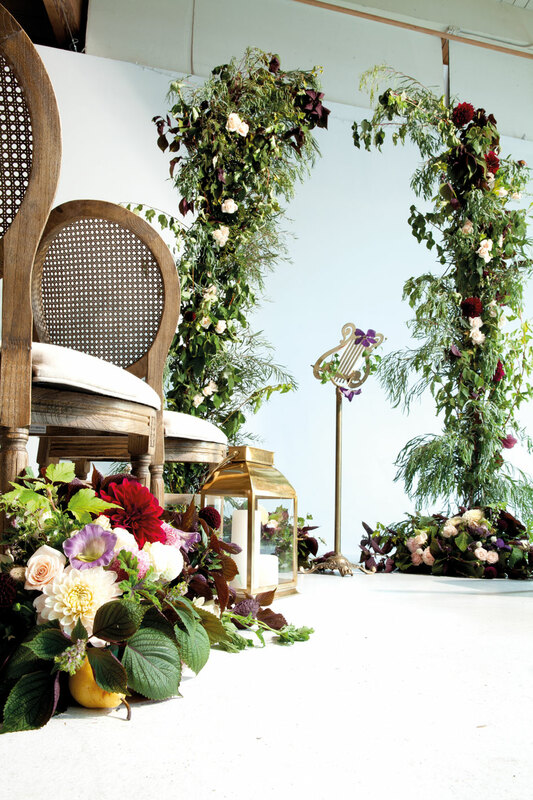 Flowers, fruit and brass lanterns bedeck the aisle and lead the way to the lush and rustic greenery arch. Cane-back chairs and brass lanterns from CORT Party Rental. Brass music stand from Fanciful Rentals. Greenery arch and floral arrangements made by Valley & Company Events. Talk about making an entrance: For their November 5, 2016, nuptials at Sodo Park by Herban Feast in SoDo, Karyn Mai and Jason Perlman created a sweeping aisle runner that not only lent a wow factor to the decor, but a special poignancy to their ceremony as well.